Mikkel Karstad is an influential chef in the New Nordic Cuisine Movement and former gastronomic advisor to Claus Meyer, the co-founder of iconic Danish restaurant Noma. He lives with his wife and four children in Copenhagen and focuses on trying to inspire people to make simple, natural food, using seasonal, local ingredients through food consulting, food styling and his cookbooks. I speak to Mikkel about his career, his style of cooking, his passion for foraging, his new book, his love of the sea and his inspirations. Mikkel was born and raised in Copenhagen but always looked forward to the school holidays when he would visit his grandparent’s house on Funen, an island off the southern coast of Denmark famous for its idyllic countryside. He often joined his grandfather on fishing trips in the Danish Straits and hunting trips in the forest and helped his grandmother maintain her magnificent vegetable garden. “It was not that they were trying to teach me something special. A natural part of life there was being in touch with nature and food,” Mikkel explains. While Mikkel’s grandmother had no formal education as a chef, she was a talented cook and worked as a kogekone, which involved making simple traditional food for local people when they had something to celebrate. She would always eat and cook with ingredients from her garden and the surrounding countryside so encouraged Mikkel to do the same. “My parents always told me not to eat anything from nature because it can be dangerous but my grandmother would encourage me to taste everything. It was a very different life with her than I was used to in Copenhagen. I went there more and more often because I was so drawn and interested in this kind of living and using food from nature. My grandmother is a big inspiration,” Mikkel says. At the tender age of 13 Mikkel already knew that he was destined for a life working in food or nature. He had enjoyed work experiences in both a restaurant kitchen and woodman’s hut but ultimately pursued a career as a chef because he thought it would allow him to combine both interests. He landed his first job when he was 15 and focused on making classic French cuisine during his apprenticeship because that was the culinary fashion across Europe at the time. However the simple natural style of his grandmother was always in his mind so, after spending a year working in London for Pierre Koffmann and Gordon Ramsay, Mikkel returned to Copenhagen to start focusing on making basic Danish food using local ingredients and innovative cooking techniques. “I call it an old Danish kitchen with a modern twist,” he says. Mikkel became an influential chef in the new Nordic cuisine movement and following stints working as head chef of Michelin starred restaurant Kommandanten and the Danish Parliament started working closely with Claus Meyer, the co-founder of the iconic Danish restaurant Noma. Mikkel was Claus’s gastronomic advisor and made TV programs with him for a number of years. 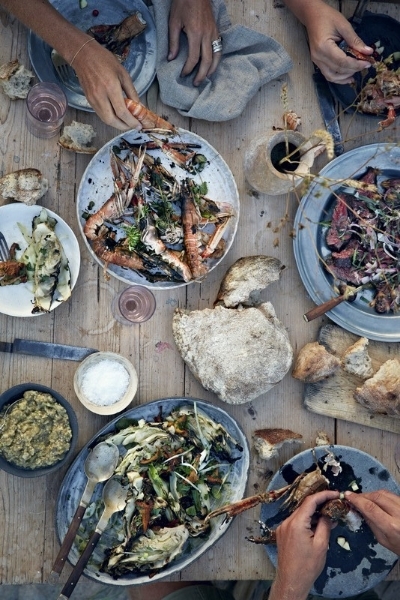 “We went to small islands and remote parts of Denmark and only cooked with local ingredients from the area we were in. It was like going back to the way all my holidays with my grandmother had been. It made so much sense to me,” Mikkel says. Claus has had a huge influence on Mikkel’s career. “The six years I worked for Claus was a really inspiring time and an amazing learning process. I have always been good at cooking but not so good at telling people about how they should cook. Working for Claus helped teach me how to inspire people to cook themselves, it was an amazing process to work for him,” he says. Mikkel now focuses his attention on trying to inspire people to make simple tasty food using local ingredients through food consulting and styling. He also spends a lot of time connecting huge food companies in Denmark with local food producers that make “interesting” products. As head chef in some of Copenhagen’s biggest restaurants it was not uncommon for Mikkel to work 90 hour weeks so part of the appeal of having his own food consulting company is that his hours are flexible and he can spend more time with his family. “Many of my friends were getting divorced because we worked so hard. It was when my wife was pregnant with my second child I decided to change lanes, still working with food but in a different way,” he explains. The first thing people eat with are their eyes so Mikkel pays close attention to the way his food looks. “If people look at my pictures and it inspires them to make something they have not tried before with local ingredients then I have accomplished what my goal is,” he says. Mikkel has developed a distinctive elegant and natural aesthetic over the years and displays his work through his blog We you they ate and his two cookbooks, which he has worked on with photographer and close friend Anders Schonnemann. The success of their first book Spis encouraged Mikkel and Anders to publish a second called Gone Fishing, which focuses on Mikkel’s open-air lifestyle and passion for fishing and seafood. “I want to show other people that it is not that difficult to take a boat, catch your own fish and prepare a meal with it. Everyone thinks they don’t have time so I try to do it in a simple way and show that it does not take all day,” Mikkel says. He also hopes the book will inspire people to try different types of fish that are abundant in the Danish straits. “I did not include any salmon or cod recipes in the book; I am trying to show people that they should try other fish like mackerel, flounder or garfish because they are cheap, really delicious when in season, and not that difficult to cook,“ he explains. Mikkel practices what he preaches so a lot of local fish that has been sustainably caught is eaten in the Karstad family home, which is located in Østerbro, a leafy district of Copenhagen just north of the inner city and a stone’s throw from the ocean. He has also just started his own city herb and flower garden, which the family uses for their daily food, and maintains a big vegetable garden in the family summerhouse. “We buy, grow and eat what is in season here. The Danish asparagus is amazing right now so we eat a lot of that and then in two or three weeks we might start eating peas,” he explains. Mikkel feels proud that his children have inherited his passion for cooking and nature. “My eldest Oscar helps me out when I cook at events so it is something we do together as a family now which means a lot to me. We also do a lot of wild cooking together and often go on fishing trips,” he says. As far as Mikkel is concerned, Østerbro is the perfect place to bring up his young family because it has the best of everything. Indeed he recently turned down the opportunity to join Claus in New York to help him open his new restaurant in Grand Central Station because he loves living in Copenhagen so much. “It is very quiet and green but you still have the spirit of the city and in 5 minutes on your bike you are by the sea. It is so easy to get around on a bike, everybody respects the cyclists,” he says. The ocean is a huge part of Mikkel’s life and he could not imagine living in a city where the sea is not close by. Every other day he goes swimming in the crisp waters of the Oresund strait to relax and re-energise. “In the winter especially it gives me an energy boost because when you go in the really cold sea you feel so alive. In a busy day it is nice to have just half an hour by yourself because with work and four kids it can be stressful. To go to the sea and swim or just look out to sea for 10 minutes and not think about too much is really important for me. The ocean means so much for me and my family and the way we like to live,” he says. Mikkel tries to instill in his four children (Oscar, Konrad, Alma and Viggo) the same lessons his grandmother inculcated in him. “At the weekends we always go to the forest or the sea to collect or find something depending on what season it is. I teach my kids the same things I was taught by my grandmother - it is healthy for them to think about what they eat and know that it is good to eat something that is naturally all around you and tastes lovely because if you buy everything from another place in the world you have to use a lot of energy and money to transport it. At the moment there are a lot of wild herbs in the forest and soon, in a month or so, the mushrooms will start appearing,” he says. The biggest inspiration for Mikkel’s work is what is happening around him at home in Denmark. “Now it is summer time, everything is exploding. When you look out of the window and see all the flowers and vegetables it gives you ideas and inspiration of what you want to cook,” he says. While Mikkel enjoys cooking in the family kitchen, which is unsurprisingly the focal point of his house, he often goes to restaurants with his wife and kids to get inspiration for new recipes. “It is very important for me in my job. There are so many things happening so if I want to work and live inspiring other people I need to get inspired myself and I do that by going out for dinner,” Mikkel explains. He has noticed that the interest in natural cooking has grown exponentially over the past few years. “There are a lot of restaurants in Copenhagen now cooking food over open fires because it allows people to put their own expression on the food by doing their own smoking or using special wood and herbs. Cooking over an open fire is like going back to nature because that is the way you cooked many years ago.” he says. Mikkel also gets a lot of inspiration from abroad and tries to travel four or five times a year, often with his wife and one of his children. “We do a lot of travelling with just one of the kids because we think it is good to spend extra, special time with them. For instance we recently went with one child to Paris and Marrakesh. We also go away as a family and recently went to Oregon for three weeks where we stayed in a small cottage with a river and went fishing and swimming in the sea. It was so beautiful,” he recalls. Mikkel feels blessed to be able to do what he loves everyday for a living. “I always think it must be like being a professional football player or something. I am living on what is my biggest hobby and that is really nice.” he says. He has worked in some of the finest restaurants in the world so I wonder whether Mikkel has ever aspired to open his own. “I opened a restaurant twelve years ago but I didn’t really enjoy it; it is really hard work being in the restaurant business in Copenhagen and with four kids I wanted to spend my time doing other things. But I might open a small place like a wine bar where you can eat some nice local, home made sausage or cured ham from a local butcher and have a nice glass of local wine or beer. It should just be really simple,” he answers. He has enjoyed a hugely successful career and is one of the leading chefs in Denmark, but is Mikkel content with what he is achieved so far. He nonchalantly says that he is “quite pleased” and as long as he is inspiring people to make food using fresh, local ingredients and try something new he can’t see that changing. However, despite all his magnificent achievements in the food world, his proudest achievement remains his family. “I have four healthy kids, they have a great outlook on life and appreciate good food. That is definitely my biggest achievement,” he says.